Apartment dwellers with few windows, rejoice—you can enjoy houseplants too! The Variegated Pothos has no problem growing FAST, even in low light. 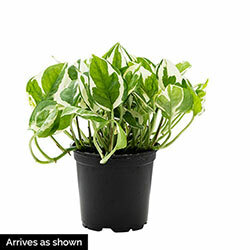 It is a long, leafy vine with beautifully marbled leaves in bright green and creamy white. It's easy to care for, too. Just water when the top inch of soil is dry, being careful not to overwater or flood the soil. 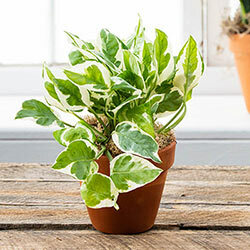 The Variegated Pothos likes humidity, so during the winter months, be sure to mist its leaves once in awhile. It's perfect in a pot on a bookshelf, where its long vines will drape around books and tumble gracefully down shelfs. That cascading effect is also nice in a hanging basket, which adds some lush, refreshing jungle flair to your home. Planting Instructions: Plant the pothos in a new pot at the same soil level when roots fill out the old pot. Soil Requirements: Pothos prefer slightly damp soil. Soil should not stay saturated with water. Pruning: Trim away discolored, diseased, damaged, or dead leaves and stems as they appear. Winter Care: Humidity is generally low in the winter months. Pothos can benefit from regular misting. Your pothos will likely need more light due to shorter days. Additional Information: Mildly toxic to pets and humans.